← How do I integrate an Online Registry Review program with an upcoming credentialing exam? Many of you may recall, when discussing artifacts I emphasize that not all artifacts you encounter are necessarily “bad”. In fact, artifacts can provide valuable, diagnostic information. Our recent blog on Acoustic Shadowing pointed out its underlying cause is the presence of a strong reflector or absorber. Knowing this provides you with a valuable inference (i.e., the presence of a gallstone or kidney stone). Think about a situation where you shout across the office to a co-worker, rather than using the phone. Your idealized wish (and intention) is that your message will be carried in a straight line between you and the intended target. The reality is that everyone around you hears your message. And this is also (get ready for a bad pun) “grating” …on your co-workers’ nerves. Despite the best efforts of transducer engineers and designers, the “main” sound beam is accompanied by undesired, weaker sound beams pointing off-axis. These also propagate, reflect, and return to the transducer. 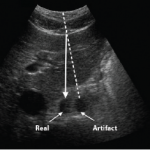 Ultrasound presumes that the reflections returning to the transducer always come from the steered direction. However, when these (weaker) off-axis beams encounter a strong specular reflector, the returning reflected energy will be received and “added” to the main beam …often creating a spurious structure or clouding within an image. From a conceptual standpoint, grating lobe artifact and refraction artifact have a great deal in common. 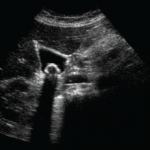 In both these cases, the path of the ultrasound beam has not followed the intended, steered direction. They are both “locational” artifacts, which is to say their result within the ultrasound image is the structure’s displacement from its true location. Generally, the spurious structure will be laterally displaced. 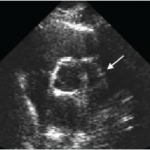 As such, without a clear visualization of a refracting surface within the image, differentiation between grating lobe artifact and refraction artifact is relatively challenging. This subject matter is discussed more thoroughly in Chapter 8: Artifacts, of Frank Miele’s Ultrasound Physics and Instrumentation (5th edition). Grating Lobe artifact is discussed specifically on page 282 and referenced in the context of discussion on the advantages of Harmonic Imaging in Chapter 10: Contrast and Harmonics on pages 329-330. 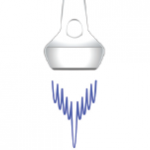 This entry was posted in Quick Concepts and tagged Artifacts, Locational Artifacts, Quick Concepts, ultrasound, Ultrasound Physics & Instrumentation-5e. Bookmark the permalink.